This article first appeared in Today's Horse Trader magazine. Breeding Paints and Pintos is not simple. The most beautifully spotted horses sometimes produce foals that have no white spots, or solid white foals that die within days of birth. Yet, some stallions and mares always produce Paint or Pinto foals -- even when bred to solid-colored horses. What makes the difference? At least four genetically distinct patterns create the white spots characteristic of Paints and Pintos. If you understand the genetics behind these patterns, you can consistently get spotted foals. Tobianos have dark heads, patterns of white that usually cross the top line, white hooves, and white on the legs above the knees and hocks. The edges of the spots are smooth and sometimes shadowed. Some have "ink spots" inside the white areas. A single dominant genetic trait, the tobiano allele, causes tobiano markings. An allele is a variation on a gene. If a horse carries this allele, it will always show tobiano or tovero markings. If it has only one copy of the allele (heterozygous), it has only a 50% chance of passing on this allele. If you breed heterozygous tobianos to each other, on the average one out of every four foals will be solid-colored. 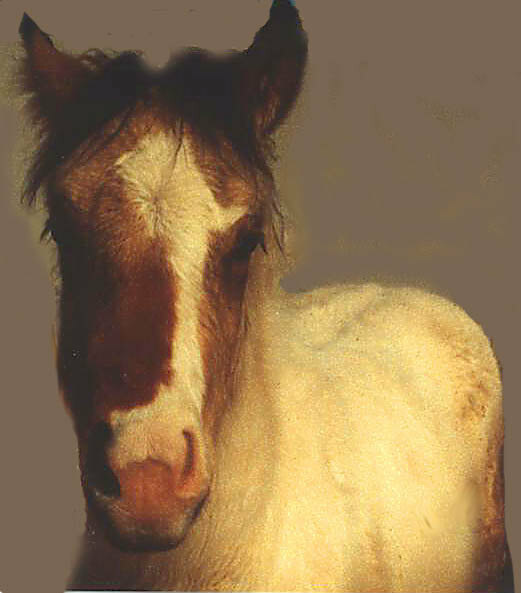 If a horse carries two copies of the tobiano allele (homozygous), all offspring will be tobianos or toveros, even if the other parent was a solid colored horse. You can be almost certain that a horse is homozygous if it has "paw prints" or "bear paws." These are areas of roan within the white spots. Blood tests can also reveal whether a horse is homozygous. The Veterinary Genetics Lab at the University of California at Davis will run the test if provided with samples of blood from the horse in question along with samples from its sire and dam. The cost is $225. A horse that is genetically tobiano will sometimes have minimal markings, not enough to register except as breeding stock. In these cases, the horse will have white hooves and stockings, yet a face with no white. A minimally marked tobiano is as likely to have tobiano offspring as are those with more white. Xerxes, a Medicine Hat Pinto at two months of age. He is a grade bulldog-style Quarterhorse. His pattern is Tobiano with a background color of buckskin. His dam, Lady Gold, was a smutty Palomino, so it is a good assumption that he is the version of buckskin caused by the Palomino gene.